Over these years, there has already been a lot of spotlight and geek speaks on building PWA and its advantages. Due to which many companies are found capitalizing on its extensive capabilities. The following post sums up on what possibilities PWAs is all set to open for businesses now and in future. Over these years, there has already been a lot of spotlight and geek speaks on building PWA and its advantages. Due to which many companies are found capitalizing on its extensive capabilities. The following post sums up on what possibilities PWAs is all set to open for businesses now and in the future. It may quite interest you to know that the total number of mobile app downloads in the year 2017 was around 197 billion. This calls for several businesses venturing into having an app developed. Now creating a traditional app can be a costly venture and often use a significant amount of data as well as storage on the users’ device. This is where PWAs play their trump card. In the present scenario, some of the top players like Google, AliExpress, and Flipkart seem to have reached a 50-100% increase in retention and conversion rates. 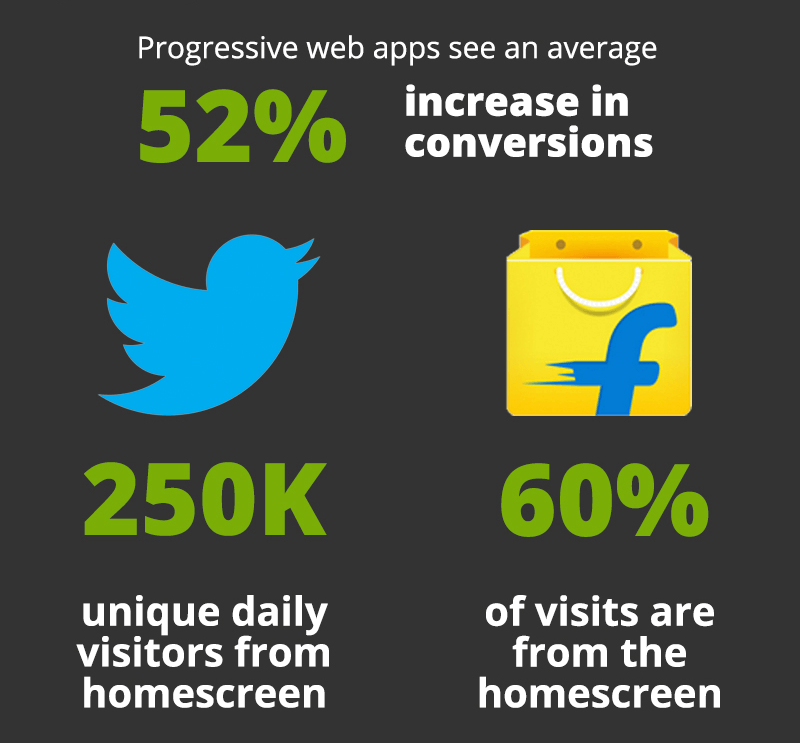 Why are Progressive Web Apps better for your business? Of course, the aforementioned figures do have some significance. Further below I would like to mention a few key advantages of PWA for business and their capabilities to find out why businesses, from startups to market leaders, should opt for them. No matter what industry you are in, your end goal is to get as many users as you can. However, web apps don’t necessarily need to be progressive- are accessible everywhere. Especially if you are located in a country with poor internet connections, PWAs is the best option for reaching more users. Many of you have been facing this misconception that web can never act as a better option for startups than mobile. But the fact is the web allows companies to reach everyone, regardless of having Android and iOS devices. PWAs do not require different versions for various devices; a single app meets the requirements of all endpoints on which it operates. It significantly reduces the amount of efforts that developers provide, and as a result, the cost to create PWA decreases. The price is three or four times lower than that of a native mobile app. In the present scenario, mobile users prefer apps instead of browsers. Indeed, applications being more user-friendly, featuring more attractive interface and can operate offline are considered more favorable in comparison to browsers. With the help of Progressive Web Apps, you can provide an advanced user experience by combining the look and feel with performance. Regardless of technologies, tools and frameworks on which PWAs are developed provide the same user experience as native mobile apps do, and it is considered to be superior to that of websites. It may also interest you to know that they have the same speed, responsiveness and comprehensive capabilities of websites with database access and automatic data. In addition to low data, storage and cost, one of the significant benefit of using PWA is it works great for SEO. 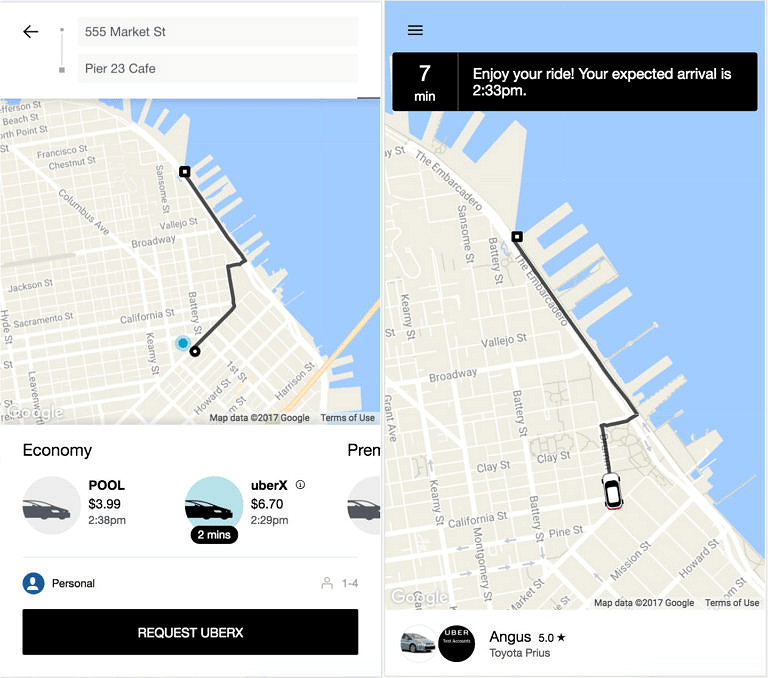 For example, Uber’s PWA takes less than 2 seconds to load. This has profoundly impacted on search engine rankings. PWA will be indexed quickly too, and it provides a great user experience which all add to the success of your SEO strategy. What if I say with PWA at hand you don’t need to require to update things now and then. It allows them to update on the automatic basis without notifying users or bothering them with permission requests. These apps update themselves whenever users visit them, thus eliminating the need to download batch changes and install them. If you are looking to come up with an app that offers a renewed look with no human participation, PWA is the right choice. Apart from aforementioned pointers, Progressive web apps can offer other benefits like simplifying the management of your points of sales, upgrading the UX of your online store or even reaching new customers in areas of poor internet connection. Although, the technology is still evolving, but the future of PWAs seems to be pretty bright. So that’s all for now! Keep watching the space to get a better perspective! 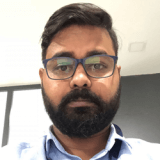 Working as a manager in a software development company Tatvasoft.com, Vikash Chaudhary also has a passion of part time blogging and love to share technical insights on various topics. When he is not working you will find him doing writing or cooking for himself. He also believes that he can be a chef in his free time. Posted February 26th, 2019 in Web Apps in General. Tagged: PWA. Why Web Apps Are Exceptional Choice To Surpass Competitive Era? It’s been a while when advanced applications were introduced to reduce businesses hassles. But still, there’s an issue which bothers individuals’ minds that how do they develop a website, should they move to the mobile application or should they choose between promoting a website, web app or mobile application? Most of the people must have heard about native apps that these are the powerful application programs that are particularly built for specific platforms or devices. Built with robust features, the apps are user-friendly and winning the arguments with optimized performance. It’s an advanced era where businesses wish to connect with their prospects directly and more personally. They strive to ensure a better experience to them while they come to your brand. The best way they chose is to develop web apps that are intuitive and reflect a first copy of the existing website. Users’ will hardly find the difference between the website and an associated web app. Web apps are especially built to be accessed on different platforms and devices. This is the reason people are admiring the way web apps are running flawlessly and without trouble. Today, developers are turning to build high-end apps. No matter, these are mobile apps or web apps, they seamlessly develop it with the same enthusiasm. But, do they know about the building blocks needed to appropriately carry out the web app development process? The web apps building blocks are based upon a few mandatory factors. One of the first is, one should deliver something to attract customers or which seamlessly meets their requisites. You should also take care that additional features should not hinder the application’s existing functions. Developers can take their web app development with module development implementation. Maintaining optimum security for web app is another factor from the list of building blocks. Keeping the site or an app safe is your prime responsibility. It is vital from both app owner and users perspectives. If your web app is not safe you may lose the data or if users feel so, they will not turn to use your web app. So, implement proven tactics to make your web app secure. A speedy web app is the requirement of every web explorer. He always finds something best to use in a speedy manner. Therefore, focus on integrating the app with functions that provide ultimate speed to a web app. Remain updated with the market’s trends and new implementations enable you to make this happen with finesse. Today, the debate is all about which one to choose web apps or native apps. If web apps, what are the applauding facts that make them powerful and worth embracing. Native apps have been in the market for so long and unquestionably offering the best and optimized performance. But, today we bet that web apps are rendering a few stunning advantages that a native app can’t approach. In this technological world, you can experience different new technologies that outstandingly support web apps and their functionality. 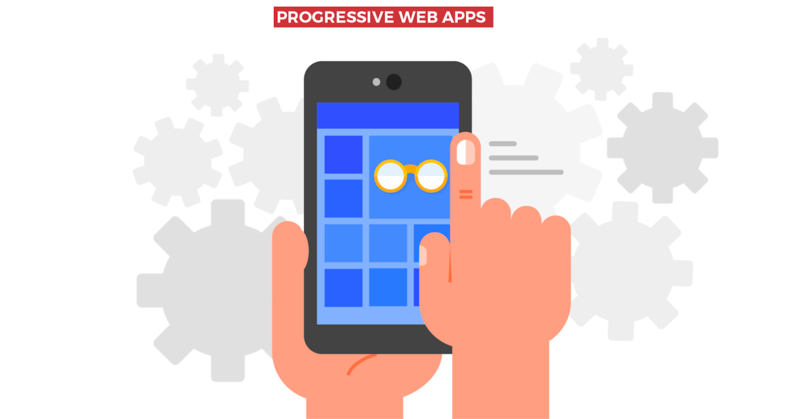 WebAssembly and Progressive Web Apps (PWAs) are the major ones that top the list. 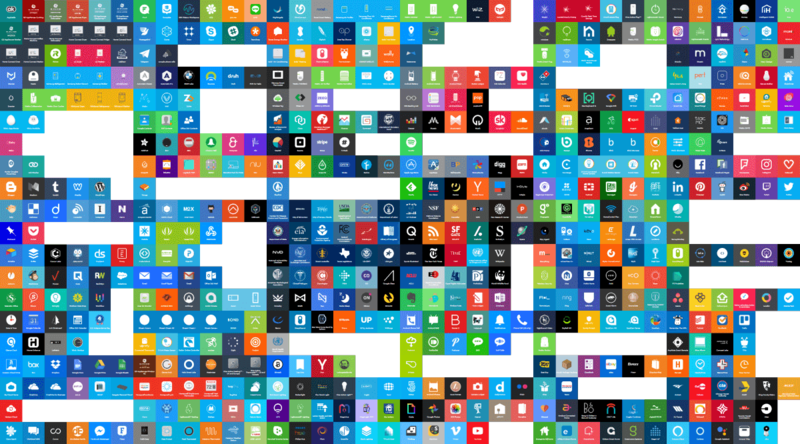 These are the powerful platforms that operate simply like regular web apps. Above all, these types of apps also possess app-like features including device hardware access and push notifications that make them a complete package to ensure better user experience. Apart from the elaborated ones, there are other technologies that have proposed to take web apps towards a bright future. These comprise React360, AFrame and WebXR are a few advanced and widely used tools that are available through the browsers and also powered by AR & VR features. The invention of new development technologies made it possible for developers to take their knowledge ahead to get better development results. Business enterprises now encouraging developers to use their advanced skills and integrate responsive sites with cutting-edge technologies. They motivate them to implement Artificial Intelligence and get deep insights into the proposed system. Also, businesses are developing solutions that are integrated with machine learning and provide accurate measures of a user behavior. Web apps are conveniently accessed by users via different browsers and also through a variety of devices operate on Android, iOS and Windows operating system. These apps don’t create troubles during update and maintenance. Whenever someone wants to make updates in content or app design, he/she can simply publish the updated version to the server. The changes will immediately get reflected in the existing web app’s layout. Such web apps are easier to discover as these are light weighted and visible on the search engines on the top. It is said that major search engines like Google & Bing also prefer web apps to list them on the top of the list. Visitors who frequently use your website will automatically get redirected to the web app if they are accessing the site with a handy device like smartphone or iPad. Web apps or mobile apps work exactly like a standard website and developed by integrating the sole database. The best part is that these somehow also perform like native apps. Business-oriented web apps considerably take more time, developer base and cost but, above all these ensure better performance and improved user interaction. You must have got an idea that which one is better to embrace in this trending era. It’s nothing that you can’t use native apps as these provide better and improved performance. It’s your choice what you want to choose for your business growth. But, you should give a look to the web apps as these are in trend and satisfying customers with the improved user experience. Tom Hardy author is a dexterous UX designer at Sparx IT Solutions. He is passionate and accomplishes every project with sophistication. Having years of experience in the same domain, he gathered the courage to accept even challenging task and get it done with professionalism. He is also a professional writer and tries to impart his knowledge among people by drafting informative blogs on UX improvements. Posted December 26th, 2018 in Web Apps in General. Tagged: AR, PWA, VR. A wise tech-guy once said, “It all comes down to data and how it is exchanged”. Spot on we’d say! Laptops, hand-held devices, smart TVs, all send and receive data. Apps, websites, and software programs, all function on data. Needless to say, there’s an obvious connection there. The invisible thread between devices and software programs / apps, is the data binding them. It is ‘data’ which enables apps to control devices. Each and every device operates according to the hardware interfaces and software programs running behind it, which in turn communicate by exchanging data. And with almost every modern device working the ‘smart’ way over the Internet, data and its constant exchange across channels, devices, and apps has become the new reality of tech world. Almost all of us use one or more web apps in our personal and professional lives on a daily basis. And if you’re in the habit of working with multiple websites, your data footprint is probably more than others. Every web app directly or indirectly collects or generates different data on different assets. “Assets” here include people and the devices they use every day. When we say “web apps generate and collect data”, the kind of data we’re referring to includes everything from general signup information like name, age, gender, address, contact number, etc. to more personal information like habits, preferences, messages from social media interactions, food choices, to-do tasks, and a whole bunch of other stuff. Whether you realize it or not (or want it or not), you have an online identity which can give any arbitrary tech guy every single detail about your personal and professional life at any point of time. And that is made possible by the data you willingly punch into the various web apps you use. The calendar reservations you make, the task lists you create, the kind of communities you subscribe to on social platforms, every bit of data comes together at the end to create an online version of you. Guess there’s no point in wanting to keep things private anymore! But jokes aside, when you’re going to use web apps to that kind of extent, why not use them in a way that you know exactly how much information you divulge over the Internet and through which web apps and websites? If you can centralize the information you reveal across web apps, you can control and manage it more effectively. Apart from the personal information we give out willingly, there’s a lot of other external data we make use of every day. Articles, blog and social media posts, weather data, currency exchange rates, etc. are all things which aren’t directly personal but still accessed by us to a great deal and thus contributing to our online habits. And then there are the everyday electronics and appliances we use. Smart light bulbs, smart door locks, smart air conditioners, air purifiers, wear-able devices (IoT), etc. are all little technical wonders that can adapt to our preferences and surroundings to deliver a more personalized experience. And no points for guessing how they do it. When we use so many devices and mechanisms to disperse data and information across different networks, wouldn’t things be a lot simpler if the common data could be summarized at one place, non-critical data filtered out, and relevant data shared among web apps that use it? Whether personal or external, if there was a way for users to view what data they’ve supplied to which web app while enabling web apps to collaborate through common data, things would become quite organized. Plus, users would be able to monitor and manage what chunk of their identity and preferences crosses over the Internet making their online presence much safer. You can get hold of all that functionality if you connect the various web apps you use through some kind of collaborative bridge. Fortunately, there are not one or two, but multiple entities available which can play the part of that bridge for your web apps. 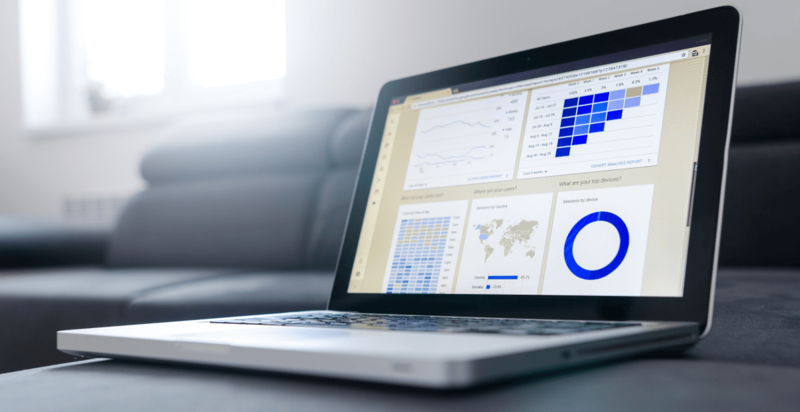 One of the brightest ways to centralize your data is to connect your web apps through a common platform, like a dashboard. You might not be aware about this but there are a lot of vendors out there who are developing platforms and tools to help people with this very task – organizing their data by establishing connections between the web apps they use. Typically, such platforms include a ton of inbuilt features like one time sign-in, report and analytics, and much more which can help you streamline your information exchange over the Internet. Connecting your web apps achieves multiple goals. Now that that’s settled, you’d obviously like to know about some great ways to connect your web apps right? Well, let’s start with something you already know about and probably use frequently without realizing its worth. APIs – heard of them, haven’t you? Among the best ways to connect data and web apps are APIs. Quite a few web apps and data sources out there include inbuilt mechanisms allowing them to “integrate” with other websites and applications through APIs (Application Programming Interfaces). APIs are in fact a set of functions enabling other applications to connect with and communicate across channels to share, search, download, and upload data. This allows connection between web apps (data exchange and executing functions) and aggregating / gathering data from multiple sources in specialized software. “Integration” is just another fancy word for the communication (information exchange) that takes between web apps. When visiting the website for a new appealing tool, one of the things most people tend to look for is built-in integrations. This feature allows the new tool you’re researching to easily collaborate with a number of popular technologies or tools that other people generally use in conjunction with the tool you’re researching. For example if you’re looking out for a new email marketing application to promote your business, you’d probably want to look for an application that has built-in integration with CRMs since marketing and customer relationship management are quite closely related. In fact, some app connections are so natural that developers include integrations as prebuilt features in their apps in order to attract more users into buying their apps. All the user needs to do is copy the app credentials (usually API Key) from one application and paste in another to make the communication happen. A common issue many tech-impaired self-hosted bloggers face is, wanting to implement a particular feature like a layout or widget on their blog that can display only specific data on particular webpages. This requirement basically needs them to extract some data from their existing blog posts and display it on a particular section of their website. Again, major data exchange needed. Enter – plug-ins, extensions, and modules built to act as bridges that can extract data from the required places and serve them at the desired places in the format of choice. Everyone’s happy! There are quite a few CMS platforms like WordPress, Magento, and Drupal that are so popular that they have their own ecosystems for integrations. Currently, there exist 60,000+ plugins for WordPress, 40,000+ Drupal modules and more than 10,000 Magento extensions. These ecosystems were originally created to enable external developers to add new functions to the platforms, but over the years they’ve evolved into great ways to connect external web apps. If you spend a lot of time on such platforms, they can be your control center where you integrate many other apps. Google Data Studio – With the number of Google web apps that exist and the kind of customer base they have, rolling out a dashboard application for user convenience that could consolidate all their data dispersed across various Google apps was just inevitable. Data Studio is free and not just taps into Google data (Analytics, Ad-Words, YouTube, Search Console, and Google Spreadsheets) but also popular database formats (MySQL, PostgreSQL) and numerous analytic data available through 3rd party connectors. Report generation, data source management, and centralized information, are just a few of the key features. Klipfolio – Probably the most versatile application with hundreds of data sources available, Klipfolio offers an online platform for building real-time business dashboards allowing business users to connect to many data services, automate data retrieval, and then manipulate and visualize the data. With features like built-in formula editing, combining and slicing data, and easy cross-device access, this platform is a great way to manage your business web app data. 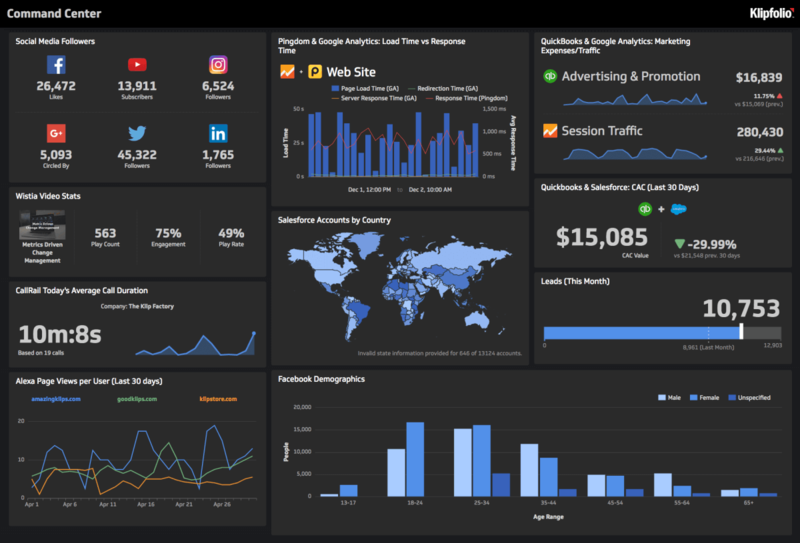 Cyfe – Great-looking cloud based business intelligence application with a ton of features (like TV-mode), Cyfe is all-in-one business dashboard designed to analyze, transform and report data from different integrated sources of business intelligence. The freemium platform enables business users track and monitor all business metrics in one single place by assembling current information from multiple sources into a single, consistent, and a coherent presentation format. Other dashboard applications deserving a mention include Geckoboard, Dash, Databox, and Zoho Reports. Some web applications offer closed lists of integrations, other enable great APIs. You don’t have to be a developer or spend time writing API clients to use data from different sources in a smart way. You can use one of the incredible tools that can integrate with hundreds of APIs (for downloading and uploading data) and just tweak them a bit by adding some automation. “Connectors” as they are often called are these code snippets which make communication between different web apps possible. You may develop your own connectors or pick one from the huge array of readymade ones available online. A lot of budding developers out there keep experimenting with their programming skills and design connectors for many popular apps for nominal prices. The simple visual interfaces of such connectors let you easily configure “recipes” and connect applications in pairs with different rules. If you’re wondering what we’re talking about, do IFTTT (“If This Then That”) and Zapier ring any bells? Hope the above list of options will enlighten you on ways to connect your web apps through centralized data management platforms. So go ahead and try it out by skimming through your subscribed web apps and checking their integration options. You can also search for them on IFTTT and Zapier integration lists. Don’t forget to share other popular, ready to use “recipes” you’ve tried out. Posted March 20th, 2018 in Web Apps in General. Tagged: api, dashboard, data exchange, integrations, plugins. There are many ways to get your work done on time, in an efficient manner, and without much risk. Opting for specialized web apps is one of them. As a web designer or web developer, you’re already aware of the benefits web apps bring to the table, like their presence on all devices, web-browser based execution, elimination of the need to be downloaded or installed, the opportunity to capture a much larger audience, and so on. But if you had to pick one key benefit they give you, what would it be? In our opinion, it would be the way they automate your work so you get to save a lot of your precious time. Web developers and designers have a lot of loose ends to take care of in their regular work. Brainstorming to find the perfect idea, giving it a shape in the form of drawings / sketches / blue-prints, conducting discussions to finalize their designs, giving them a material shape through diagram creation tools, coding to bring the material designs into action, testing whether they work as envisioned, and probably a lot many other activities. If looked at closely, a lot of those activities can be automated so that time and effort can be saved. For example, once the initial idea has been put down on paper and has been sufficiently brainstormed on, some web apps and web based tools can be used to draw it using flow diagram (or similar) constructs, the subsequent coding can be (and mostly is) achieved through IDEs, and even testing can be taken care of through specialized web apps for the purpose. So in effect, the whole mechanism of automating your work through web apps helps you save a ton of your daily work time. And when you have more time, you have the opportunity to be more productive. You can use the time you save to come up with new ideas for even better projects, conduct research on making your existing projects better, or if you like, use it to relax and give that ever working mind of yours a much needed break. Are there any web apps you use regularly? Regardless of the field you’re in, there are a ton of web apps that you can use on a daily basis. And if you like to stay up-to-date with what’s relevant, you likely already use lots of web apps. Slack, Pocket, Hootsuite, Trello, MailChimp, etc. are some of the most popular web apps people use for varied business purposes. Do you use any of them in your day-to-day work? If so, how do you find out about them; Internet research, word of mouth? Did you know that at any point there are thousands of great web apps being used out there, some you’ve probably never even heard of? With mobile application development becoming the IT trend of the decade and the consumer base for web apps increasing every day, more and more specialized web apps are constantly introduced for developers and designers. But the harsh reality is that while some of such web apps skyrocket and get all the hype, others having equal potential and a more affordable nature don’t make it to the mainstream because they don’t get the proper attention, the proper funding. But that doesn’t mean no one notices them. Over the years, several online developer communities have come up for various technologies that give small useful applications their due by getting them the right king of recognition – from other more established developers, tech-startups, potential customers, small scaled businesses, and even investors. Such communities make for great platforms where developers can showcase their work to the world, and maybe even strike the right cords to make it big. But why are we telling you this? Because until small web apps become the “next big thing”, they are just that – extremely useful web apps dedicated to solve specific purposes and very nominally priced. Imagine the kind of win-win deal you could strike if you got to know about some such great web apps that can aid you in your work and not seem heavy on your pocket too. You’d obviously want to try out such web apps. But here comes the obvious question – how would you find such apps? When it comes to searching for something on the Internet, the obvious answer is Google. In this case however, the search may or may not pan out. Not unless you specifically search for the phrases “top web apps”, “new web apps” or “top tools”. And while you’re at it, you may want to optionally add a launch year to narrow down the search results. Remember we mentioned communities where new tools, products, and apps can be showcased to catch the right attention? Well, Product Hunt is currently the mother of all such communities! Founded in 2013, Product Hunt is a platform dedicated to the sole purpose of letting people share-and-discover new products. It’s a global platform which surfaces the best new products every day for enthusiasts to share and geek out about the latest mobile apps, websites, hardware projects, and tech creations. And it works on a simple user voting principle. So a product that actually sits well with the users of Product Hunt gets up-voted to the top of its lists. Anyone, designer / developer / coder, can submit a product on the platform and it will be listed in a linear format among all products submitted for the day. There’s a comments section for each product which allows users to post their direct feedback (invaluable for the developers behind it) and a voting system that enables users to rate it. If there’s a place where you can find awesome new web apps, this is it! Another gold mine for new apps, products, and ideas, Betalist is a community of makers and early adopters showcasing their startups and exchanging feedback. A quick look through its website and you know you’re in the right place. Technology, Marketing, Finance, Business, Socializing, and startups from every other field you can envision head over to Betalist to gather pre-launch responses from end users. Browse through their homepage to sift through all new apps for the current week and click on the ones you like to view their brief introduction, get their website link, share about them on social media, and/or up-vote them. Simple and effective. If you’re a real early adopter, eager to check very fresh web apps, you definitely want to check out Betalist. Alternative: BetaPage. Over the past decade, a number of social news websites and shows have come up which are backed by people who are passionate about bringing innovation in the way things are done. They invest in upcoming startups, product vendors, and web app makers, so that talented people can continue doing what they do best. One of the prominent players in this field is the team behind Y Combinator. Y Combinator is an American seed accelerator founded in 2005 by investors from different walks of life. The company created a new model for funding early stage startups and invests in a large number of startups twice a year. Two years later, they started Hacker News, a social news website focusing on computer science and entrepreneurship which highlights notable work by programmers and developers and also provides them much needed funding. When looking for new web apps, Hacker News is also a place you’d want to check out. GetApp – Portal that puts up tool and app reviews and introduces you to new upcoming apps that can help you grow your business. Here, you can search for web apps from different business verticals like sales, marketing, finance, collaboration, human resources, communication, BI, etc. so you can search for exactly the kind of app you’re looking for, sorted by a category filter. Capterra – Giving away its nature through the tagline “Find Software”, Capterra enables you to compare products, read reviews, and get access to the latest software research to find the right solution for your business. The software and apps listed on this portal are divided across 500+ categories, backed by 325,000 reviews, and used by some of the biggest organizations worldwide. G2Crowd – Powered by real user reviews, G2Crowd is probably the fastest growing software and services search platform. With categories spanning across e-commerce, hosting, CRM, analytics, security, IT management, content management, and more, this platform allows people who have used an app or software to give their detailed feedback of the product in the form of a review so as to enable other potential users make informed decisions. Other notable names in this list are CrozDesk and TrustRadius which again offer the same functionality, in a different packaging. Another smart idea for finding web apps that have already been verified by the market and became popular is looking at available integrations lists of Zapier and IFTTT. But it is quite probable that on website as widespread as these two, you won’t find what you’re looking in the first time around (it’s probable, not certain). If that happens, you can return to these web pages to check if something of your interest has been posted a little later. Pro Tip: You can monitor the changes to these lists with change monitoring services like VisualPing so that as soon as something of interest comes up, you’re informed. Probably the best way to discover new apps and quickly learn something about them is to subscribe to our blog notifications. We keep posting reviews of great web apps and tools here every now and then so you can stay updated with what’s buzzing. Found an interesting app, but considering if it will really benefit you? Often, even after finding a web app a user thought would be great for their work they don’t seem to have benefitted from any significant value addition. This can happen when they start searching for an app without really penning down their goals, the list of requirements they’d need to fulfill to reach those goals, and an estimate of the kind of time they’re willing to invest in accomplishing those goals. As such, they can end up with a web app that has potential, but doesn’t really suit their current purpose. It is worth it to regularly check the online market space and find new web apps as some of them can really make your work (and life) easier. Of course, it takes some time, but with a little effort you can automate (or outsource) a substantial part of it and derive some real value. Posted February 21st, 2018 in Web Apps in General. Tagged: beta, discover, productivity, startups, tools, web applications, web apps. With the consumer base for web apps increasing exponentially every day, developers have dawned into a new profit making strategy. They’ve come up with innovative ideas to design addictive web based applications that can keep you hooked on to them for a major part of your day. So much so that after some time when the web app shows you a small flashy “offer” sign somewhere in the corner, you jump at the opportunity of experiencing or witnessing something new and sign up instantly; often without realizing what you’re getting into. And more often than not, people subscribe to countless web apps even if the total subscription amount they’re paying every month is a little too much on their pockets. While that is true, many a times web app subscriptions are crafted in such a manner that opting for them is actually justified. If for an acceptable amount of payment you get to take the benefit of additional features and the developers behind the app can make some recurring revenue, everybody wins. The only real trick lies in spotting the truly beneficial app subscriptions and ensuring that they don’t start becoming unfair to you. So are you ready to glean on a few smart subscription tricks? Well, do read on. Considering the reasonable benefits detailed above, it is only natural for web developers across the world to feel pulled towards launching more subscription based web apps. As a user too, the benefits are quite alluring, but evaluating every aspect of web app subscriptions is wise before putting money on the line. That’s why you should be aware that there are multiple subscription models for web apps and you should be picking one that suits your needs best. À la carte – app features are priced individually and the total subscription price varies from user to user depending on their selected features. Pay what you want – every user receives the same features but can choose their individual subscription price, above a minimum threshold. Not much data exists on the viability of this model, so use with caution. In most models payments happen monthly, which fits comfortably with personal customers (monthly salaries) and the business market (monthly accounts); but yearly subscription apps prove to be more beneficial in the long run. Combining the facts that almost all popular applications have launched their web app versions and that over 60% of the world’s population use smartphones and tablets to browse the Internet, it won’t exactly be rocket science to reach the conclusion that most of us use more web apps than desktop applications in our professional and personal lives. Some of such apps are free while others paid; but when you’re in the habit of using an app every day, paying for it doesn’t really matter. Imagine if you’ve subscribed to even 5 – 6 web apps. How much money are you spending every month on just the subscriptions? You probably don’t think about it much, but in total, all the SaaS subscriptions cost you a little fortune. Now, all of us have the good sense of saving a little even when we spend, and that’s what prompts us to opt for sales, discounts, and offers on our favorite stuff. So why don’t we apply the same logic to our web app subscriptions? While you might not be able to end all your web app subscriptions (and it’s not very wise to do so too), there are ways in which you can save on your web app subscriptions. The first step towards keeping tabs on your web app subscriptions is to track them. Some of us enroll for monthly / yearly subscriptions for so many web apps (domain hosting, web hosting, email marketing, insurance, online music, Netflix, etc. ), we don’t even remember which one’s we’re subscribed to. Keeping things organized always helps track the loopholes and see more clearly. So start keeping a track of all your subscriptions for easier management. You can track your web app subscriptions manually with free software programs like spreadsheets (MS Excel or Open Office), for instance, or with the help of specialized tools built solely for the purpose like TrackMySubs.com. TrackMySubs.com gives you access to interface based subscription tracking. It shows you an organized list of all your monthly and yearly subscriptions along with the amount you need to pay when you want to renew and the date when you need to renew. You can customize the tool’s interface to show all amounts in the currency of your choice. Using it gives you benefits like automated alert and reminder systems (so you never forget to renew subscriptions), multiple currency support (so you know how much you’re spending in your own currency), and detailed reporting (so you can break down your expenditure on subscriptions and know exactly how much you’re spending on them every month). 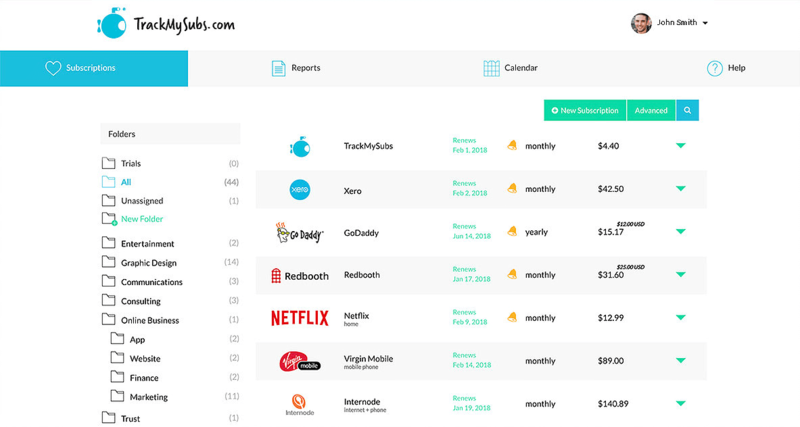 A key benefit to using dedicated subscription tracking tools like Trackmysubs.com is that they help you find ways to save money by spending less on unnecessary subscriptions. Some even suggest alternative, better deals. A study earlier this year by a popular cash-back website found that nearly a quarter of us continue to pay for subscriptions because we find it too hard to cancel them. It is human nature that once we are signed-up to something it feels like too much of an effort to unsubscribe. No matter how much you think that cannot happen to you, if you’re keeping tabs on your app subscriptions, you’ll find a few you’re paying unnecessarily for. Whether you forgot to cancel a free trial or are still paying for an old subscription that you don’t use anymore, spot useless subscriptions and cancel them. You might end up saving quite a bit. Though picking a smaller amount over a big one seems like the obvious choice, when it comes to subscriptions, going for the higher priced annual subscriptions is advisable. If you choose a monthly subscription owing to the difference in amount, think of how much extra you’ll end up paying if you continue using the app for over a year. It is almost always much cheaper to pay up-front for a year than for every month. Moreover, annual subscriptions give you access to discount and offers which in turn help you save on the entire deal. Additionally, users who go for annual subscriptions are eligible for regular updates, more advanced features, and proper technical support from the app vendor, all of which are absent in monthly subscriptions. Annual Subscriptions are basically win-win for both you and the app vendor. Often when using the App Store or the Google Play Store, we purchase and subscribe to web apps directly from them. What we don’t realize is that sometimes these stores apply additional fee on top of the web app subscription rates to make their cut of the deal. This can be disadvantageous to you as a user. You could actually save a few bucks by directly going to the app vendor’s website and subscribing to the app from there. A typical example of this scenario is the claim by Spotify back in 2015 through which it encouraged its users to cancel their App Store Spotify subscription and re-subscribe directly through the Spotify website. The app vendors claimed doing so could help users save up to $3 per month on their subscription. When a new web app is launched, the team behind it is usually looking to expand their user base. A positive review, a recommendation, or word-of-mouth publicity by a user who has tried the app goes a long way in establishing that user base, so look for bonuses offered by the developers of the web app you’re subscribed to. In exchange for sharing your positive recommendations of the app on social media, inviting new users, and writing reviews, they might offer you free account extensions helping you end up getting free subscription for some time. Coupons.com – Probably the most used (and most loved) coupon website out there (with an overall user satisfaction rating of 4.5 / 5 stars), this website offers thousands of deals on popular brands, printable coupons, and a mobile app. RetailMeNot – Another coupon giant who gives customers access to hundreds of thousands of digital coupons and offers from retailers, their coupons range across a wide variety of popular categories, including Accessories, Art, Automotive, Baby Products, Beauty Products, Books, Clothing, and many other options. Offers.com – Keeping user benefit in mind, this coupon website helps you take advantage of legitimate freebies by validating each of them and weeding out the ones to avoid. By showing only legitimate deals, this website protects yours from being fooled while digging for deals on the Internet. DontPayFull – Another great place for access to online coupons, coupon codes, discounts, and promo codes that are added and updated daily. A bit of careful digging around and you just might find the deal you’re looking for. And while you’re at it, sign-up to be informed about the latest deals on app subscription coupons so that you don’t miss a chance to save. It may sound far-fetched, but something as simple as talking to the app provider could be just what you need. Quite frequently, app providers are on the lookout for regular customers who are eager to sign up for yearly subscriptions with them in exchange for a little discount. If you’re already signed up with them and want to extend annual subscription, you can catch them at just the right moment. It is very likely that if you tell them you’re considering extending your subscription, you’ll have all their interest. Then when you ask about any special offers – they are most likely to give you one. While the above tips are sufficient to help you save some serious money on your subscriptions, another handy tip could be signing up for deals at websites like AppSumo, StackSocial, or MightyDeals. They offer mostly lifetime subscriptions which means you pay once, really good money, and use forever; basically a good deal if you get it for an app you know you’ll use for more than 2 years. If you’re a smart shopper, becoming a smart app subscriber is something you should definitely make an attempt at. We know you’re busy – but if you manage to assign some time to this task, you could be able to significantly lower your fixed costs. Posted February 1st, 2018 in Web Apps in General. Tagged: coupons, plans, rebates, SaaS, savings, subscription. Web applications or web apps have become the new norm for everything online. Just a decade ago, in the age of desktop based programs, who would have thought of a time when nothing would need to be hosted or managed locally? But that distant possibility has become modern day’s reality where everyday tasks like emailing, messaging, researching, and even activities like shopping have intermingled with client-server based architecture into applications users fondly call web apps. They’re interactive, engaging, and useful. From webmail, wikis, and instant messaging services, to online retail sales and auctions, almost each user demand is being fulfilled through web apps. But have you ever stopped and wondered what is it that gives web apps their power? Exactly how are web apps different from traditional desktop based applications apart from a sleeker front-end? How can a user new to the concept find the right web app for his purpose? Through this article, we’re trying to answer all these questions and more. What makes web apps appealing? Over the past few years, the market has seen a shift of trends as far as mobile app development is concerned. While native mobile apps are still popular, web apps that run directly in browsers have captured everyone’s attention. Currently, there are thousands of interactive web apps out there targeted at solving various purposes. From everyday home users to professionals like web-designers and web-developers, people are raving about the utility and the ease of operation web apps bring with them. Moreover, with mobile browsers supporting features like geo-location, vibration, microphone access, and many upcoming specs for HTML/DOM APIs like device orientation, people prefer to use their hand-held devices for everything. So much so that vendors of popular native apps are rolling out web app alternatives. The time for the creation of an ecosystem where developers have the freedom to choose which type of app best suits their project doesn’t seem too far away. They are cost effective to develop – Businesses don’t need to develop different versions of the same application optimized for different operating systems since all components of the app are online. All that needs to be done is browser testing. They are easily customizable – All the user is concerned with is the application’s front end. So businesses only need to update its look and feel or presentation to suit users of different ages and preferences. They make it possible to capture a wider audience – Since the devices used to access web apps cover a broad range including PDAs, mobiles, tablets, as well as desktops / laptops, a much broader range of users can be targeted and captured with such apps. They offer better interoperability – It is far easier to integrate a web app with another than it is to make a desktop application communicate with another. Web-based architecture facilitates rapid integration of enterprise systems while improving workflow and enhancing business processes. They’re scalable and more secure – For web apps that need more power, only the server hardware needs upgrading making them extremely scalable. Also, since such apps are deployed on dedicated servers monitored by experienced administrators, they are far more secure than desktop applications which are managed at the client directly. Given such key benefits that web apps bring to the table, it is no wonder businesses across the globe prefer pumping huge money into web app development. Deciding that you want to go with a web app to complete a particular task is only half the battle won. The other tougher half involves picking the perfect web app that will help you fulfill your goal with minimum or no hassle. And believe us when we say this, finding your ideal web app from among the huge variety available online is quite an uphill task. Especially when there are tons of web apps built to the same end. It should be accessible on different devices and browsers, example iOS – Safari as well as Android – Chrome, etc. Finding a web app that stays true to all the criteria mentioned above though difficult isn’t impossible. And generally, everything stays good as long as your requirements don’t change drastically and the web app you’re using continues to fulfill all your needs. But, what happens when either your requirements expand, or the capabilities of your chosen web app seem limited? Why are users compelled to look for web app alternatives? When user requirements change from a fixed set to a wider one that includes 3 or 4 more needs, the app they’ve gotten used to might fall short of the occasion. In such cases, users are compelled to move on to more advanced web apps having more features while also retaining the capabilities they fell in love with originally. To understand the point better, consider a simple scenario wherein you’re trying to plan your travel to an exotic destination. Imagine that after researching online and reading a lot of user reviews you pick a great travel planner web app and use it to materialize your plans successfully. Once that trip is done, you don’t feel the need to upgrade to a more advanced app and in fact, don’t use this one much either. Now for your next trip, you need ideas along with relevant flight and hotel details (and booking support) and you also wish to carry out detailed comparisons between different destinations. Since your earlier set of requirements was quite limited, the app you needed at that time was very basic. However, now you need something better. You need an app that doesn’t just show you a set of destinations to pick from (depending upon your preferences), but also show you available hotels and flight combinations for that destination all within the dates and budget limits you’re targeting. Obviously, your current app cannot do all that. So you start looking for a new web app. 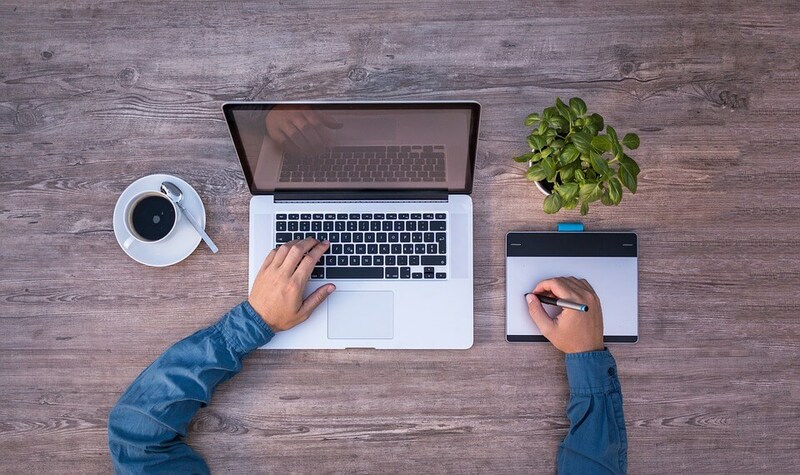 Here you could opt for one of two approaches – research for the perfect web app from scratch; or find for an alternative web app, one that includes the basic features you originally liked, along with more. Getting the drift? If you are, you’ll agree that this opens up an entirely new avenue – web apps that suggest alternative web apps. For clarity’s sake, let’s call these alternative suggesting web apps, tools. There are a lot of tools and techniques available online which allow users to search for the perfect alternatives to particular web apps. Let us take a look at some of these. Given the vast variety of web apps available in the open online market, it is quite unlikely that there is only one app for one purpose. There are several apps that achieve the same purpose but differ in prices, features, performance, interfaces, etc. ; and when you begin searching for a web app alternative, you might find one that suits your purpose and pocket more than the one you’re currently using. This one is obvious. Google has the answer to everything, literally. So when in need for an alternative web app, just enter what the app does in the search field or use “[app name] alternatives” as the search keyword and Google should throw some pretty decent suggestions at you. You could also type the phrase “[app name] VS” and look at the suggestions for apps that come closest in functionality. Sometimes, the Wikipedia page for the app you’re currently using has a ‘Category Page’ section that lists apps similar to the current one. That can be helpful. Over the past few years, Quora has emerged as one of the best place for users to directly ask questions to other users about pretty much anything under the sun. Simply post a question on Quora asking “What are the best alternatives to…” and you should start receiving suggestions soon enough. This question is in fact one of the most popular queries on Quora. Facebook and LinkedIn are awesome forums to join groups of people like-minded to you. Once you become a member of a group, you can ask people there about alternatives to the web app you’re targeting. However, these social groups come with a minor drawback. Before posing a query on them, you should perform a thorough search. Questions like “alternatives to [app name]” are quite common and it is very likely that someone might have already asked for an alternative to the app you’re going to ask about. Group members don’t appreciate repeat questions. 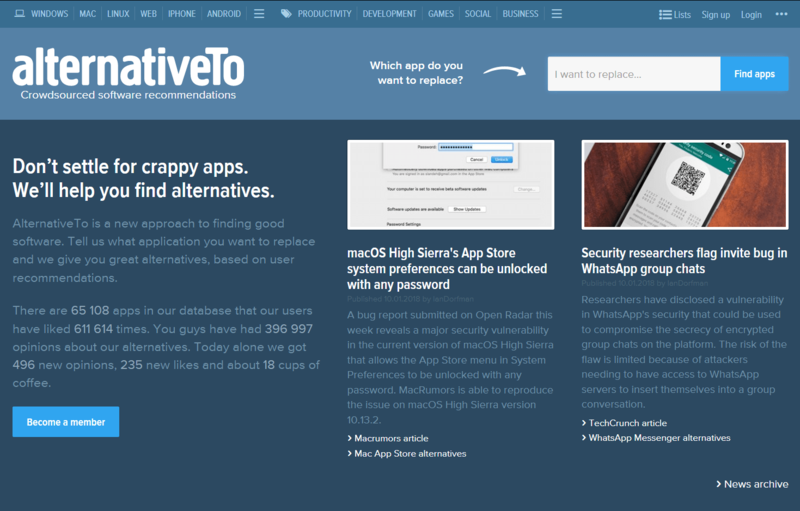 AlternativeTo.net – With an extensive database that includes information about almost 65000 web apps, this approach to finding great software prevents you from settling for anything less than the best. AlternativeTo.net lets you easily search for alternatives to some of the most popular commercial web apps like Adobe Photoshop, MS Word, MS Visio, AutoCAD, and free web apps like YouTube, Skype, Google Chrome, etc. SimilarSites.com – A cool and simple way to discover the best websites and alternatives on the web, this tool helps you find related sites and topics similar to the ones you love. It offers website recommendations for similar pages while intelligently giving you more options. Alternative.to – One of the most comprehensive sources to find alternatives to products, places, solutions, answers, and pretty much anything – including web apps, this tool even lets you compare the various alternatives and choose the best one. While all the above methods are equally good to pick competent alternatives, it’s important to compare all available options and satisfy yourself completely before making a final choice. When subscribing to a particular service or tool, once you attach yourself to a provider, sometimes it becomes really hard to migrate to another because of complexity issues. Now for the fun part! It’s time to weigh how web apps actually fare when in action. We’ve been scouting the Internet for the most useful and user-friendly web apps for Web Designers, Web Developers and Internet Marketers. The following 10 beauties are just a sample of 100+ applications we have reviewed. Do dedicate a bit of your time to reading about them and if possible, play around with them whenever you can just to get an idea of all that web apps are capable of achieving. Other hit names that we didn’t include in this list are Evernote, Slack, Twitter, Dropbox, etc. which are no less popular and continue to play the part of industry titans. The mesmerizing world of web apps holds a lot of promise for almost every project and need you can think of and there are tons of options to choose from. So before you decide to write off a task as undoable, look around and try to find a web app which can do it for you. If you find one you like but can’t use for some reason, rest assured that somewhere there is an alternative to help you out. Posted January 11th, 2018 in Web Apps in General. Tagged: alternatives, choose, compare, select, web applications, web apps.